Voted the best UK hotel by Condé Nast in 2013, the Connaught hotel has been an integral part of Mayfair grandeur since its opening in 1897. This traditional slice of Mayfair grandeur takes its design cue from the English country house. The Connaught in Mayfair was originally intended as an oasis of calm for the landed gentry of England to retire to during their hectic visits to the capital. Little has changed since the opening of the hotel in 1897 - doormen in top hats and white gloves still usher guests into the majestic entrance hall with its magnificent mosaic floor and grand wooden staircase, and the age-old tradition of afternoon tea is still re-enacted daily. The Connaught's Gallery room exudes rich, sumptuous elegance and style and provides the perfect, luxurious setting for afternoon tea which is served. Skip the lifts and enjoy the traditional country house feel of the mahogany staircase that winds up through this grand century-old hotel. The Connaught is a traditional slice of Mayfair grandeur that takes its design cue from the English country house, while offering facilities that are absolutely up-to-date. Delicate finger sandwiches are served alongside a wide range of classic and modern teas. The Connaught in Mayfair was originally intended as an oasis of calm for the landed gentry of England to retire to during their hectic visits to the capital. Little has changed since the opening of the hotel in 1897 - doormen in top hats and white gloves still usher guests into the majestic entrance hall with its magnificent mosaic floor and grand wooden staircase, and the age-old tradition of afternoon tea is still re-enacted daily. The Connaught's 'Chic and Shock' afternoon tea is served in the Espelette, a pretty room overlooking architect Tadao Ando's water feature. Delicate finger sandwiches are served alongside a wide range of classic and modern teas. Scones come fresh from the Connaught Bakery, and are joined by an incredible menu of over 16 home-made jams and a spread of cakes and pastries. For an extra dash of luxury, opt for the Champagne Afternoon Tea experience. If you're feeling a little over-indulged, then skip the lifts and enjoy the traditional country house feel of the mahogany staircase that winds up through this grand century-old hotel. The Connaught is a traditional slice of Mayfair grandeur that takes its design cue from the English country house, while offering facilities that are absolutely up-to-date. The tasting menu at this inventive restaurant is a true experience. Following Angela Hartnett's departure from The Connaught hotel in Mayfair in 2007 the restaurant reopened the following year with Helene Darroze as the two Michelin-starred Executive Chef. Great ingredients, often sourced from small producers, are the secret to a relentlessly inventive menu packed with star dishes which centre around fish, foie gras, pigeon, and beef. The menu is either a five, seven or 13 dish affair and you make your choices by selecting marbles. The sommelier is very knowledgeable and will happily recommend wine pairings and, if you're lucky, show you around the underground wine cellar. The atmosphere in the restaurant is formal and serious without being stuffy and, like the hotel's stylish Coburg Bar, the design is by Parisian designer India Mahdavi. The lunch/pre-theatre menu is particularly good value, the tasting menu may be expensive but it's worth it for a once-in-a-lifetime experience. Dress code: smart, a jacket is preferred. No trainers or sportswear. This award-winning bar is expensive but worth every penny. If you're after perfection in a glass in an ultra-stylish location then look no further than the main bar at The Connaught hotel in Mayfair. The bar has been lavished with awards: senior mixologist Erik Lorincz won the Diageo Reserve World Class Bartender of the Year 2010 and Agostino Perrone won the International Bartender of the Year 2010 at the Tales of the Cocktail event, New Orleans, where the Connaught Bar picked up the World's Best Hotel Bar 2010 award in the process. The bar also offers a signature serve of whisky and bespoke chocolate tasting to enhance the characteristics of the whiskies. It's not cheap (you won't get much change from £30 for two drinks) but given the shimmering platinum silver leaf décor, the superb individual service and the meticulous attention to detail that goes into everything that you sip, you'll agree that being treated like royalty is money worth spent. What's more, the bar snacks are refilled regularly and come at no extra cost. A traditional bar with a modern designer twist. Beyond the doormen in top hats and white gloves outside the Connaught Hotel there are two outstanding bars, the second of which is the swish Coburg Bar, a traditional bar with a modern designer twist. Parisian designer India Mahdavi recently added to the long-standing comfort of the intimate and inviting bar with a few contemporary enhancements. Wood panelled interiors and antique pieces are counterbalanced by modern art works by Julian Opie, plush velvet and leather seats and geometric print carpet. Cocktails are expertly made - an apple martini, for example, uses the hotel's home-marinated cinnamon, pear and apple liqueur. There's even a special Bacchanology menu which provides a history lesson into the origins of each drink on the menu. Granted, it is on the expensive side, but service is excellent, there's a great vibe to the place and the cocktails are scrumptious. Espelette is a relaxed bistro-style restaurant with sweeping views of Mayfair's Mount Street. Tucked away inside London's legendary Connaught hotel, Espelette is a relaxed bistro-style restaurant with glass windows leading to sweeping views of Mayfair's Mount Street, Carlos Place and 'Silence', a water feature designed by Tadao Ando. Open throughout the day, it offers a selection of Helene Darroze's signature dishes inspired by the town of Espelette and the South West of France. The lunch, dinner and all-day dining menus feature Gallic favourites like fish soup with garlic croutons; lobster salad with crispy celeriac; and chicken stuffed with wild mushrooms with sauce poulette. The three course Menu du Jour offers excellent value for money and features simple, seasonal brasserie fare - perfect for low-key business lunches. The restaurant also serves breakfast and traditional afternoon tea so you can dine at any time on first class food in an informal, brasserie-style setting. This Asian-inspired spa provides pampering at its most indulgent. The luxury Aman Spa in the basement of the marvellous Mayfair hotel, The Connaught, is the first and only UK spa from the world renowned Aman Resorts. This is five star pampering at its most indulgent. The Connaught is a grand old building which recently emerged from a dazzling £70m-plus refurbishment which included the grand unveiling of the sparkling new spa on 25th November 2009. The spa in the hotel's new West Wing has been kitted out with a sleek Asian inspired interior and Thai silks and spa users have the pool and exercise room at their disposal too. The overall effect is a feeling of being in a unique cocoon. Reassuringly expensive - Aman resorts are famed across the globe for their celebrity clientele - a simple treatment list includes a holistic facial, Oriental oil massage and Chakra balancing treatment. For the ultimate extravagance, there's the Aman Spa Experience - a little pricey at £280 but for that you get two and a half hours of unadulterated bliss. But the real attraction is the way they make guests feel like they're queen for a day - and this is down to the therapists who are not only skilled in beauty techniques but in treating you like royalty too. 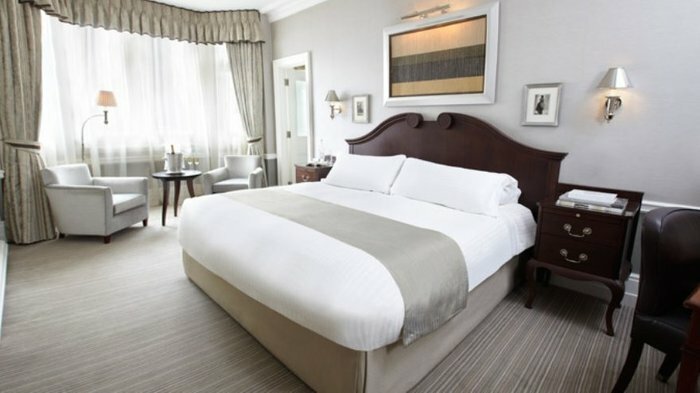 From cheap budget hotels to luxury 5 star suites see our deals for hotels, including The Stafford London Hotel from 37% off.